For all: Nehru library archives are not restricted to one man. They include the writings of and about Nehru’s contemporaries and successors. Before we had Narendra Modi, we had, besides Nehru/ Indira/Rajiv, a whole train of non-Nehru/Gandhi PMs: Gulzari Lal Nanda (twice); Lal Bahadur Shastri; Morarji Desai; Charan Singh; VP Singh; Chandra Shekhar; Deve Gowda; IK Gujral; Atal Behari Vajpayee (thrice); Manmohan Singh. None of them asked that they be given space at Teen Murti House to commemorate themselves. The aspiration to immortalise himself in the same location as the founder PM of Independent India belongs uniquely to the bloated ego of Modi, whose saving grace perhaps is that he recognises he can’t usurp a location on the premises unless he includes himself in the pantheon of successor PMs to Nehru. Moreover, Modi implicitly acknowledges this needs to be done urgently because the bell tolls and soon it will be time to intone the obsequies for the Modi regime. Where, however, to lodge this monument to Modi (and, incidentally a few others)? The avaricious eyes of Modi bhakts alighted on a set of barracks that, since the past 51 years, have housed the modest Jawaharlal Nehru Memorial Fund (JNMF) — not to be confused with Nehru Memorial Museum and Library (NMML) — whose principal task is to compile, contextualise and publish some 97 volumes of the collected works of Nehru to serve the purpose of historical enquiry. This academic work, essential to the understanding of how Independent India came into being and how the foundations of our modern nationhood were laid over the 17 years of Nehru’s premiership, has been assiduously pursued in the modest, worn-down barracks, first under the great historian, Dr S Gopal, and subsequently under other scholars, far removed from the swinging pendulum of our daily politics. Until, that is, the advent of the current PM who had distinguished himself during his campaign for the top post by not knowing that Alexander never reached Patliputra and mixing up Nalanda in India with Taxila in Pakistan, besides displaying his ‘scientific temper’ by declaring that Ganeshji’s elephant-head proved Indians knew plastic surgery millennia and millennia ago. It, therefore, comes as no surprise that he sees no obstacle to disrupt decades of dedicated documentation of the laying of the foundations of today’s India. What need is there, he may think, of such vain scholarship when a Rs 4,000-crore statue can tell it all! JNMF has thus been ordered out on the grounds that its presence (where it has been for half a century and through seven non-Congress regimes) is ‘unauthorised’ and ‘illegal’. JNMF has obtained a stay of eviction from the Delhi High Court and hearing is set to commence on November 16. While awaiting the judicial outcome, the next six months will quickly pass and by May 2019 we may have a new PM and a new government. The new lot may — or may not — put an executive end to this farcical playing with our national heritage. Why the hurry? It reflects the anxieties of a regime that recognises that it is ‘now or never’. 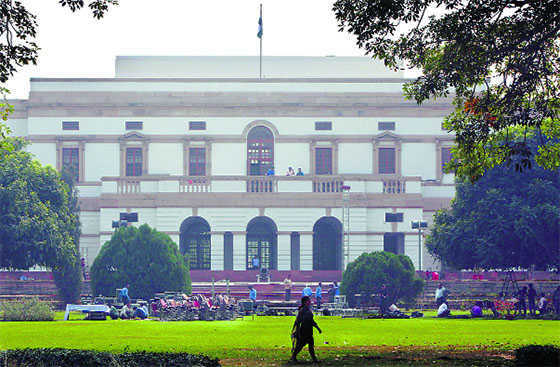 Nehru Memorial Museum and Library is just that — Nehru MML. To diminish it is the objective of the current regime. To this end, it has packed the executive council with its ideological acolytes, all of who are Nehru-baiters, and not one a historian of any distinction. Second, it is playing partisan politics with an institution that is in the name of one person, but has an ambit that, like the man it hails, stretches across the canvas of the freedom movement, from the late 19th century to the formulation of the parameters of our new nation. The archives in the library are unmatched. And are not restricted to one man; they include the writings of and about Nehru’s contemporaries and successors, many of who had profound differences with him. But because Nehru’s credentials as a democrat were unimpeachable, NMML has had no hesitation in placing on its shelves documents relating to the contribution of any freedom fighter. These documents do not include self-serving testaments of those who played no role in the struggle for Independence, beyond writing petitions to the Viceroy pleading that they were ready to pledge their lives to the greater glory of the empire. But even such documents could find their way in if they passed the rigorous academic criteria on which the collection has been built. Memorials set up to individual leaders are meant for them and do not prevent other memorials being set up for others. John F Kennedy memorial in Boston does not include George Washington or Donald Trump but is true to the original purpose of the memorial — the documentation of the Kennedy years. Nor is Lenin’s mausoleum being crowded out by whatever is sought to be remembered of Stalin through Brezhnev and Gorbachev to Putin. Ho and Mao lie in solitary spleandour; there are other venues for others. If Modi wants to immortalise himself, he can build a 182-metre monument to himself, with intermediate floors given to ‘gurus’ of the ilk of Savarkar, Golwalkar and Upadhyaya. But why do it in Teen Murti? Why besmirch a national monument that has built for itself an international reputation by throwing together several has-beens of uneven duration and contribution in a mish-mash that derives from the white lies that have characterised the current PM’s encomiums to himself and his rule these past five years? Modi has no right to appropriate the legacy of other Prime Ministers to conjoin them to the aberration of his present passing eminence. None of them (above all, Vajpayee) had anything to do with Modi’s transgressions of the fundamental parameters of the Raj Dharma.